We love forbidden fruit, especially when that fruit is a diesel, manual, four-wheel drive small pickup truck not meant for the U.S. market, like the Volkswagen Amarok. Believe it or not, there’s one for sale in Pennsylvania right now, but you may not want to buy it. As you may well know, here in America there’s a stupid rule against importing non U.S.-spec vehicles that are younger than 25 years old. 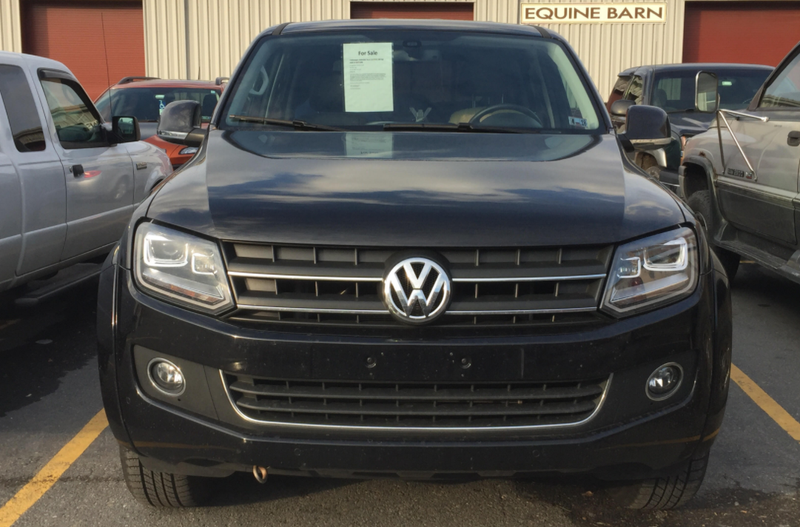 The Amarok in these pictures—sent by a reader named James, who spotted the truck in the parking lot of a traveling gun show—was first registered in 2015, so it’s clearly not a quarter of a century old. So why is it for sale stateside? After seeing these photos, I called the number on the for-sale sign, and found myself speaking with a soldier in the German military who’s stationed in the U.S. for training. The man, named Andreas, told me that because of what’s called a “SOFA Agreement,” German soldiers are allowed to bring their Euro-market cars to the U.S. and drive them legally without American titles. When I asked Andreas whether he could legally sell the vehicle, he said the folks he spoke with at his importer and also at U.S. customs seemed to indicate that he could indeed get a U.S. title for his truck and that he could sell it, though he’d have to pay taxes since he hadn’t paid any upon entry. Andreas told me he admittedly was a bit suspicious of these answers, saying the information wasn’t clear, and it wasn’t on paper. “Nobody could tell me exactly [if I can sell my truck in the U.S.]... Customs said ‘if you have a title, you can sell it,’” he told me. Hedrick points out just how limited the EPA exemption is, also stating that, because import duties weren’t paid when the vehicle entered the U.S., the subsequent owners would be liable for them. “In my opinion the vehicle in-question would be subject to seizure and forfeiture by the U.S. government and the individual who imported the vehicle would also be liable for civil penalties by virtue of their declarations and subsequent actions in violation of those declarations,” he said. So you could, but you probably shouldn’t. Andreas now plans to bring the Amarok (which is apparently expensive to insure in the U.S. and difficult to find parts for), a German-market Jeep Cherokee, and a Chevy Suburban (!!!) back with him to the beautiful land of Bavaria. Hopefully I’ve not only saved him some trouble, but I’ve helped out a buyer who might have had their vehicle seized. More importantly, hopefully I’ve kept one diesel manual VW Amarok from the jaws of the junkyard crusher.